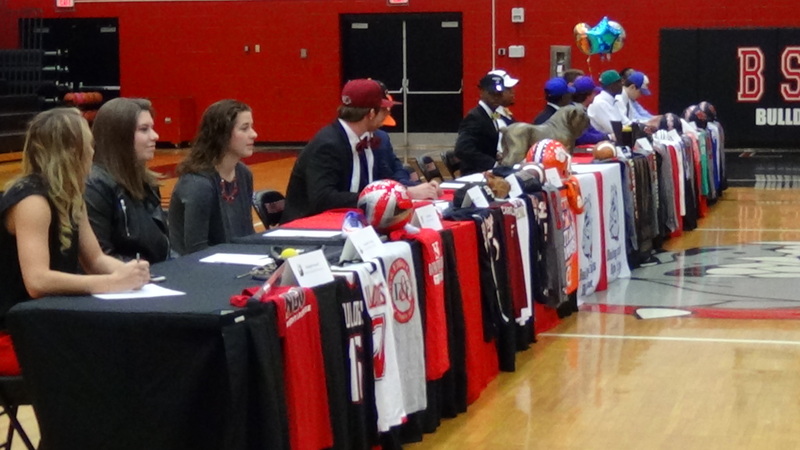 With Wednesday being National Signing Day there is excitement in high school gyms all across the country as student athletes make decisions about their college futures and at Boiling Springs it was no different as the Bulldogs had fourteen students sign national letters of intent to continue their athletic careers at the collegiate level next season. Of the fourteen students that committed on Wednesday, nine committed to play football, two for baseball and girls lacrosse, and one from the Lady Bulldogs soccer team. Mikail Coleman, a starting safety for the Bulldogs football team this past season, will continue to be a Bulldog at the college level as he committed on Wednesday to continue his athletic career at SC State. Coleman this past season recorded 64 tackles,3 for a loss, and had four interceptions. When asked about his commitment to SC State Coleman said, “I feel really good about it, I’m just ready to continue this journey.” Michael Bollinger who played tight end for Boiling Springs committed to continue his football career at Liberty. Bollinger finished his career with the Bulldogs with thirty-seven receptions for 550 yards and six touchdowns, two of them coming in the state championship game against Dutch Fork. Two other members of the football team also committed on Wednesday but it was to play baseball at the collegiate level. Mason Streater, quarterback for the football team, committed to play baseball at South Carolina next season. Streater this past season was named the 2016 SCHSL 5A Offensive Player of the Year. When asked about his commitment to South Carolina Streater said, “It’s a good feeling. I’ve been waiting on this for a while and I’m just ready to go.” When asked about the chances of him possibly seeing time on the gridiron Streater said with a laugh, “No, that’s probably not going to happen.” Justin Brasher, another member of the football and baseball team, committed to play baseball at Erskine. Brasher is a four year letterman for the Bulldogs baseball team and was All-Region in both his sophomore and junior year. With the fourteen commitments on Wednesday added to the five that signed in the fall, that now makes nineteen current commitments for the Bulldogs athletic program that will be playing college athletics next season.